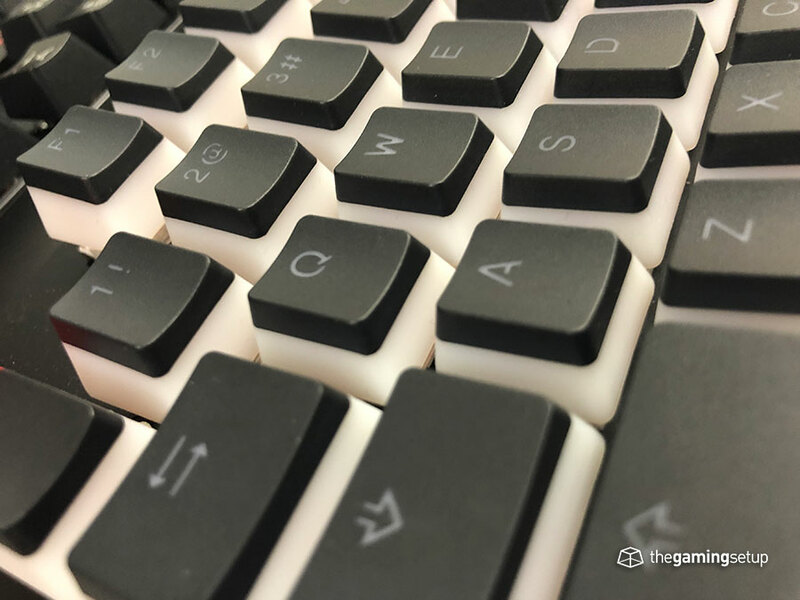 April 2nd update: The GMMK Compact and TKL are now different from the unit I reviewed in this article, they’ve added a bit more heft to the keyboard which is one of my largest cons with this keyboard. I’ve yet to get the newer version but when I do I’ll update with a new review. Much respect to Glorious PC Gaming Race, they get what people want. The GMMK is super customizable and should be a first consider if you don’t know exactly what you want. The modular switch design allows gamers to modify their keyboard switch without soldering. 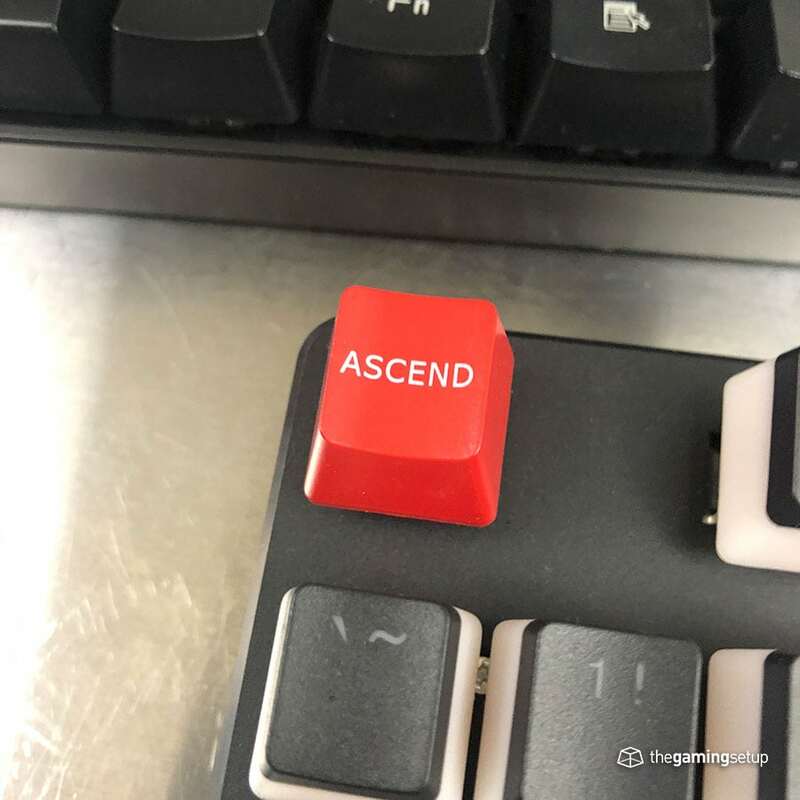 The standard bottom row allow gamers to use whatever keycap set they want. For a price of around $100 USD this keyboard is a great value, but there are a few parts where corners were cut to achieve this feature set and price point. The keyboard has some mediocre feet and a light weight that makes the keyboard a bit slipperier on a smooth surface, you might want to use this keyboard on a desk pad. I think I’ll be hard pressed to find a keyboard solution as customizable as this one with any of the big brands. If you want to experiment with your keyboard setup the GMMK is definitely the keyboard for you. The GMMK is a really unique keyboard with the ability to swap out switches, its build quality is okay but the GMMK offers huge value and flexibility in a single board. The Glorious GMMK has a highly customizable and minimal design, no branding or badging on any surface of the keyboard. 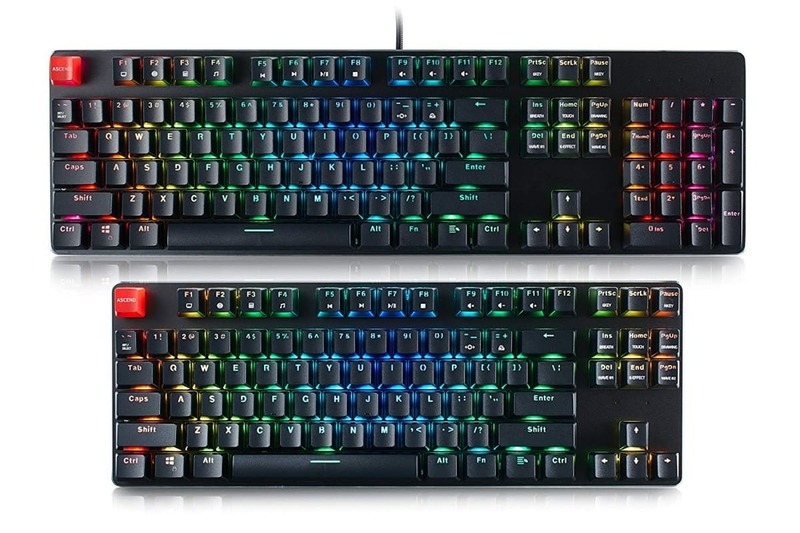 The keyboard comes in two main configurations, full 104-key size or the smaller tenkeyless (TKL) size both feature standard key row sizes and don’t have much of a frame outside of the keys themselves. It’s a design aesthetic I prefer, keeping the main footprint of the keyboard low. The advantage here is obviously you build a keyboard suited to you, you can also buy them pre-built off of Amazon or their official store. The GMMK I’m reviewing is a TKL with Aura keycaps and Kailh Box Red switches. Holding off on all the customization for later, the design of the keyboard features some pretty standard feet, a removable USB cord and minimal caps lock and scroll lock LEDs, no non-standard buttons, no dedicated media keys. The GMMK does have function keys for media and other shortcuts, but the aura keycaps I got didn’t have any indication of where the functions keys are, so a little bit of a learning curve there. Looks like the standard set of keycaps have alternative function labelled keycaps included. The font of the keycaps is okay, some of the letters like Q and R have a horrendous style that I do not like. On the up-side it’s not too gamery and the icons are tasteful. The case of the keyboard is low profile, which is a cool aesthetic and allows for easier cleaning of your board. The case of the keyboard is plastic with the base being made out of a black brushed aluminum. 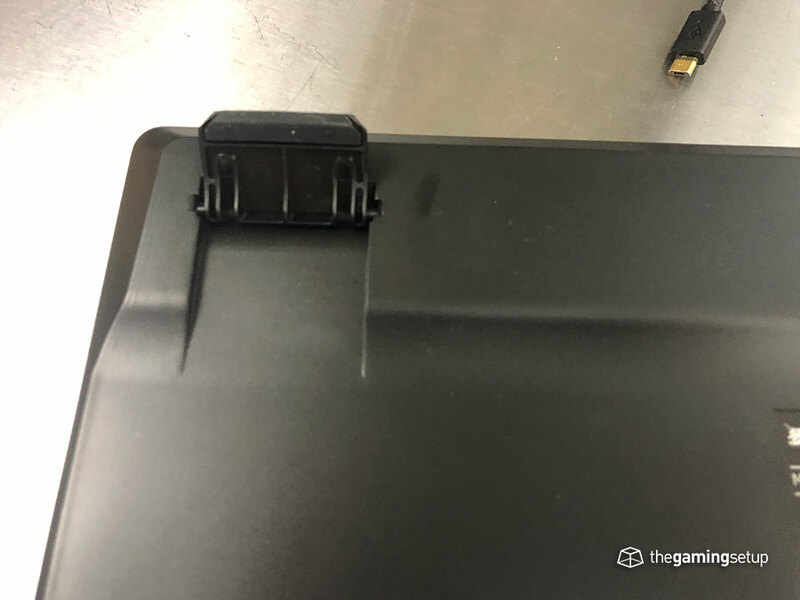 The edges of the case have a steel (I think) chamfered edge. There are a lot of subtle design choices that add a tiny bit of flair while keeping the keyboard as a whole minimal feeling. The entire keyboard is quite light, I found the keyboard moving around quite a bit, the feet don’t have enough grip to prevent that. Personally, I prefer a heavier keyboard to have it rooted in place when typing or gaming. 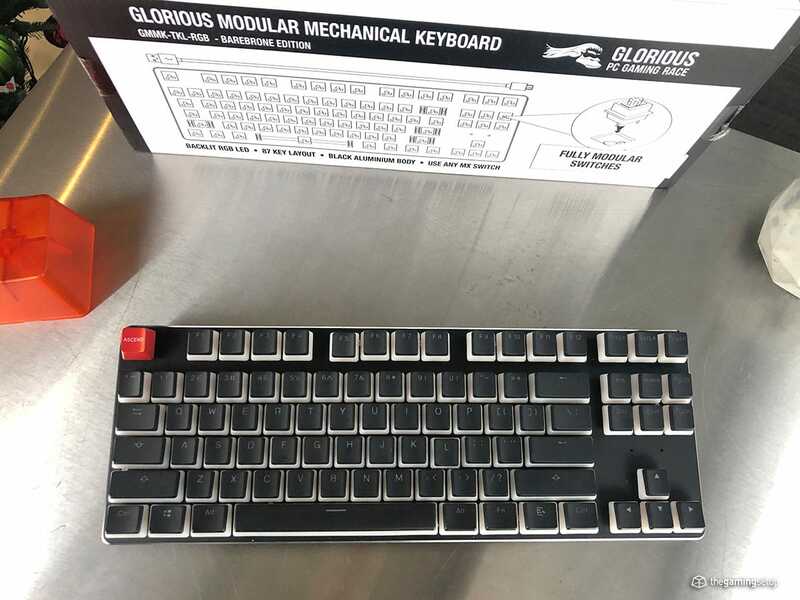 Here’s how our Kailh Box Red switches sounded in the Glorious GMMK and compared to the Logitech Romer-G tactiles switches found in the Logitech G Pro Keyboard. This is my favourite mainstream keyboard for switches, the keyboard allows you to plug and play any switch without soldering but they also pre-include a bunch of switch options when purchasing. You can also get a pre-built GMMK off of Amazon with Gateron Reds, Browns or Blues. If you have a specific switch you prefer you can actually buy them and install them yourself, as long as they’re compatible. This is actually a very valuable way to test different switch types in an actual keyboard, no other mainstream keyboard allows you to do this, you can get modular keyboards from more enthusiast keyboards. 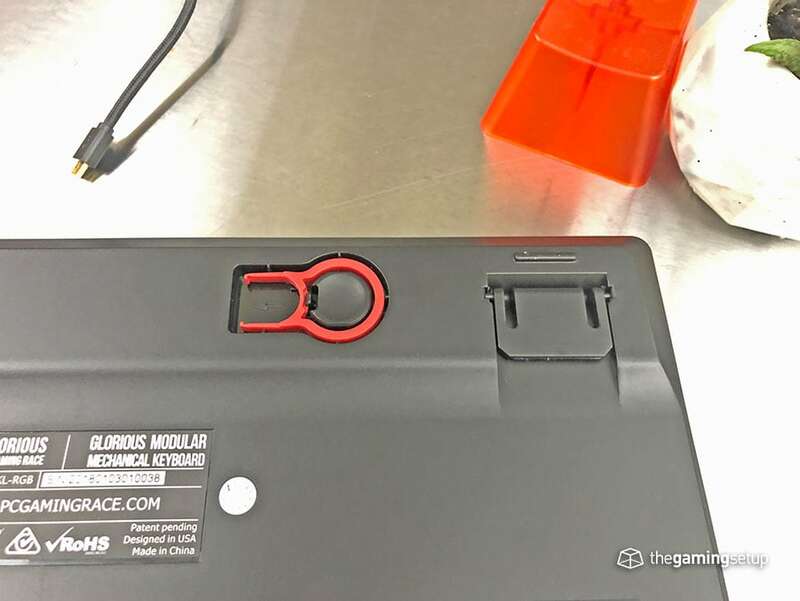 Here’s how quick it is to get the switches changed, all tools are included with GMMK, though I will caution that the packed in keycap remover that the GMMK comes with can scratch your keycaps, a wire keycap remover is a little safer. You can use any switch that is plate mounted, 3-pin and SMD LED compatible, luckily the large majority of switches are compatible. Once installed, the switches are solid, they’re placed in solidly with actual less wobble than the Romer-G. The sound of the switches are as expected, no creaks or weird pinging against a metal backplate. The sound of the keyboard is a little loud though, the switches kind of echo in the housing. The GMMK is is a standard row keyboard which means its going to be compatible with the majority of custom keycaps, if you buy the GMMK from the official site you don’t have to buy their included keycaps. The higher priced Aura keycaps from glorious are double shot keycaps topped with PBT. Very nice quality and feel, the lower half of the keycap is transparent which allows for that really cool “pudding” style glow. Thickness of the keycaps are okay, I don’t think you’ll have much issue with durability with the Aura keycaps. The standard black and white keycaps feature the same font as the Aura keycaps, but are made of double shot ABS plastic instead of PBT. With extended use these keycaps will get a little shinier. Every keycap set comes with a cheeky master race keycap as well as a standard esc keycap. Overall a very good keycap offering from the GMMK with the option to use whatever Cherry Stem keycap set you want. As mentioned previously, this keyboard is pretty light, I suspect there’s not much actually inside the case of the keyboard and the case itself is made of a lighter plastic. I do wish the GMMK was a little heavier and reinforced to have a more solid feeling keyboard. It feels good, but it definitely doesn’t feel as good as a tankier metal keyboard like my daily driver. The keyboard does flex a little bit when twisted, but not a shocking amount. No creaking detected on the keyboard. The cable is a high quality braided cable that will not anytime soon wear down. The sockets and stabilizers in the keyboard itself look solid, no reason for concern of switching switches often. 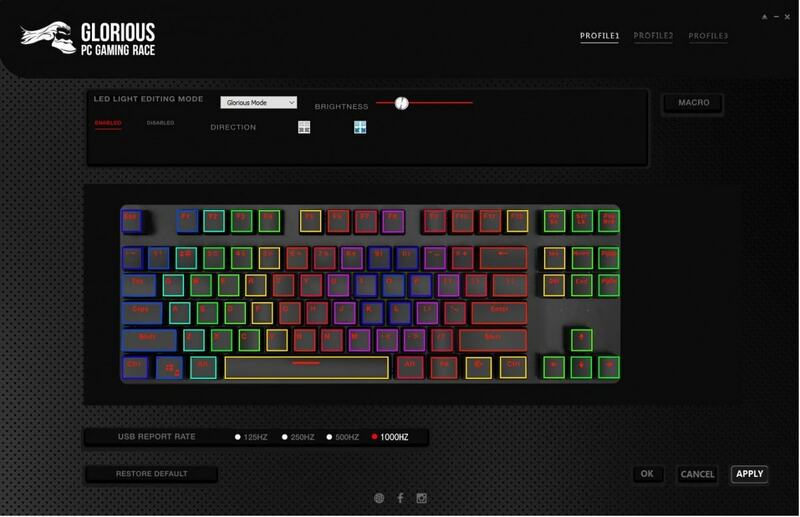 Here are some of the more standard features that every gaming keyboard has now. The GMMK also includes a keycap puller on the back, a nice little touch. The software on the GMMK is a little lacking, you have to download your software based on the serial number. That’s it, you can use this keyboard without installing the software. The GMMK manual shows that the warranty on the keyboard is 1 year. That kind of warranty policy is disappointing, changing keycaps and switches is an advertised feature of this keyboard. That being said, I would find it hard to imagine anyone damaging their keyboard if they replace switches and keycaps in a standard way. The Glorious GMMK is probably the best starting mechanical keyboard you can get. The ability to customize your switches and keycaps without any hassle lets you figure out what you actually prefer. For the price, roughly $100 USD for a full set up, its a great value compared to some of the bigger brands. The GMMK is really well designed with customization as its key focus and unique value in a crowded keyboard space. 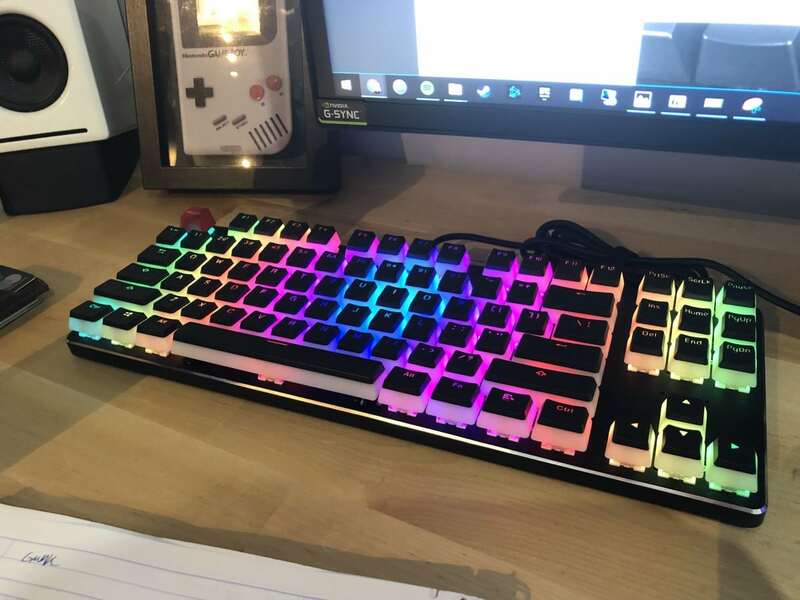 It has great RGB and good keycaps. Where the GMMK lacks is in the overall build quality, you can see where they cut corners to keep a great price, the feet and the weight of the keyboard do hinder the experience slightly when using the keyboard. Nicely done, but it can be better. Really. Just so you know, this is an overpriced OEM keyboard that is similar to the Tecware Phantom Elite. Physical design and the software of the product itself are basically the same, so I’d rather buy myself a Tecware Phantom Elite, not this. Also, you should know that this type of keycap puller is bad for your keycaps. 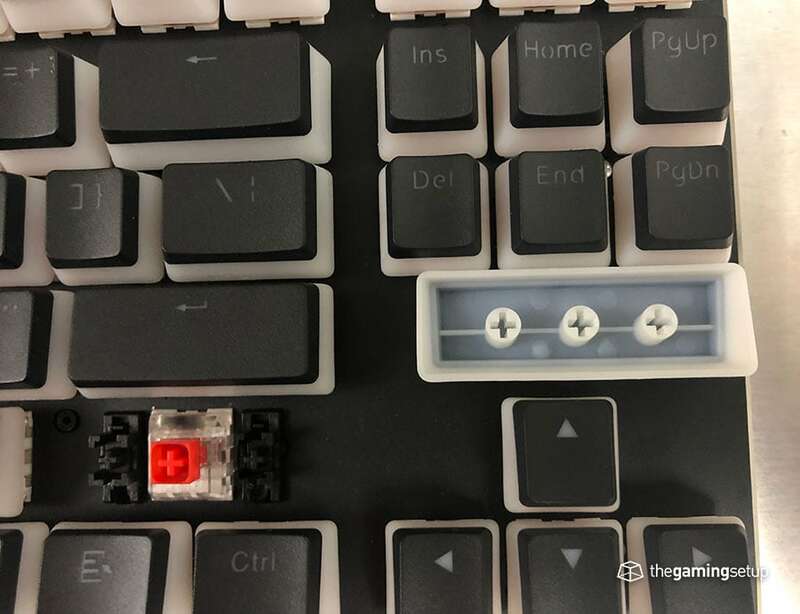 Not only that it will potentially scratches you keycaps, it will also causes potential issue like pulling out the entire stem together with the keycap if it’s too tight. A metal wire type puller will give you less issue when you try to remove a keycap as the force are applied evenly from the bottom of the cap. Just my 10 cent. I like that gameboy of yours btw. Hey yerodog thanks for the comment! Wasn’t even aware of the Tecware Phantom Elite and good call on those key cap removers, will update the post to reflect those cautions. The Tecware Phantom 87	listed on their site and the versions being sold on Amazon, are not nearly the same as this board. I have the original Gen 1 Red LED only model, and it’s always allowed any 3 pin switch to fit. However only the newer Tecware Phantom Backlit Keyboard ELite does this. Their other models, including the one you mention, are the ones that only accept Outemu switches, because of the super tight fit. This is confirmed on both their page and the Amazon sale pages for their boards. 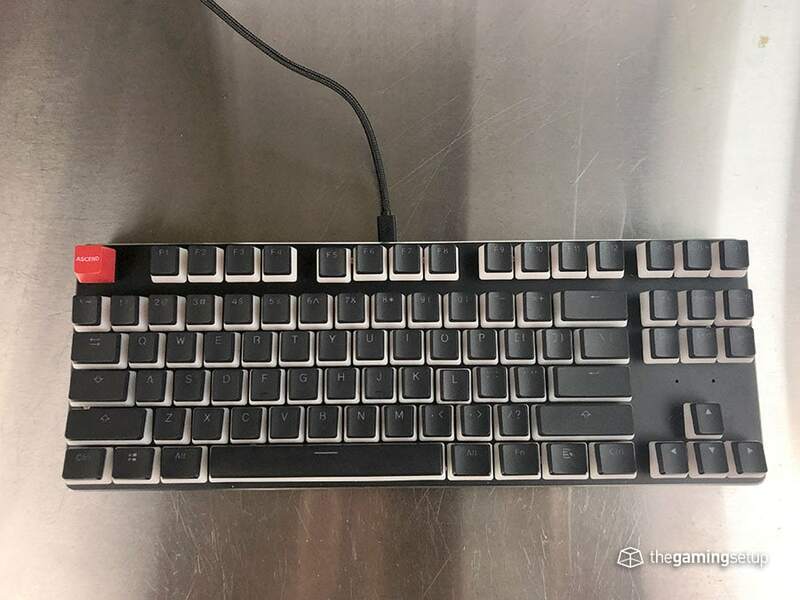 “Question: Do Kailh Box switches fit in this keyboard? 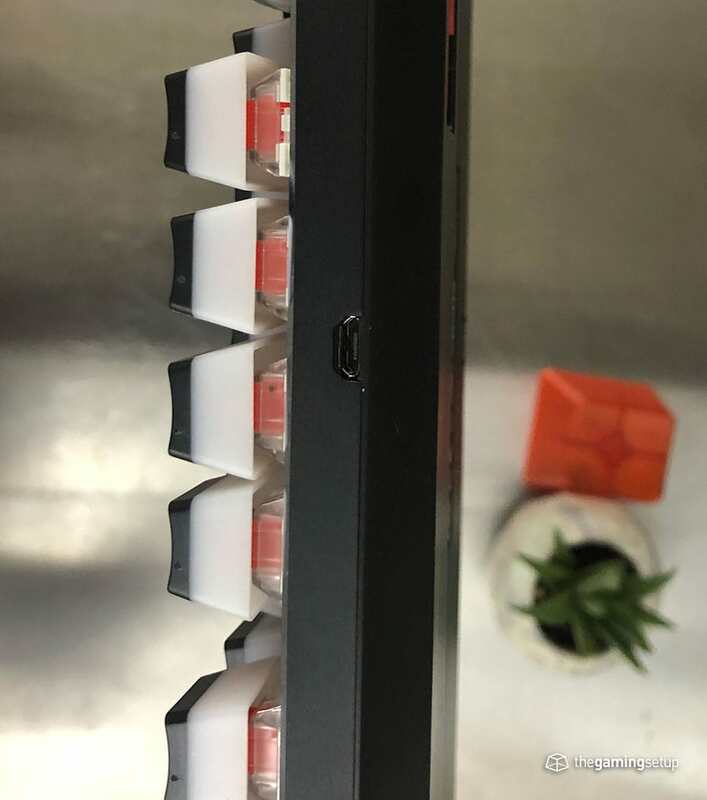 Answer: Hi, Sorry but this keyboard only supports outemu switches, the kailh box switches will not fit. Hi Brent, thanks for clarifying! I can’t seem to find the Tecware Phantom Elite on sale anymore so it’s very important to clear up. Tecware Phantom Elite = Pretty much the same as the Glorious GMMK without a removable cable. Yeah. I have three GMMK boards and wanted to make sure no one made the mistake of getting a board where you are stuck with one switch manufacturer. I also love my KBDfans GK64, but the GMMK have a good combo of value and features. So you got a board with switches installed then? They announced Feb 2019 that they made three changes that would be phased in starting with the 60% and TKL Customized (no switches installed) boards at first. The supposedly used a heavier base plate, lubed the stabs, and included sound dampening. Do you know if your model was the new version? I just ordered the new version TKL Custom to replace my 1st Gen 104, not because it’s given out, but just to get some more space on my desk. I’ve changed switches 4 times now btw. My GMMK is definitely pre revision, I got this one before they announced the 60% version. So doesn’t have the heavier baseplate yet, it’ll feel a lot better with that in there. Like what Glorious is doing in general with their products I’m going to have an Odin review up as soon as I can. I installed the switches myself on the GMMK. My daily driver is a KBDFan! I’m using a DZ60 with 67g Zealios. I like your taste! Let me know how the new gen GMMK is when you get it! Absolutely! I migrated my older GMMK TKL to a custom Box Brown Mac Keyboard for an editing rig. Used Mac Fn row shortcut keycaps form MaxKeyboard and a free software called Karabiner Elements. Trying to get my Mac user friends to get on the mech train. The new model should be here by next week. I’ll be sure to post the update. Have an excellent weekend. Just built the new version of the custom SN 201812 US (typing on it now). I don’t have a scale but it is much heavier than my 201801 model TKL, even after that one has a bunch of silicon rubber mat in nearly every crevice of its case. It didn’t feel too solid until I built it out, but then it felt like a tank. The stabs are much more stable, and are pre-lubed. There was already a nick in its front bevel, and it had some loose cloth strips in the Caps Lock’s socket, but those didn’t take much to tuck under the plate. I moved my Box Whites, aluminum Baymax ESC keycap, and the red gradient PBT RGB keycaps from the 1st gen full size model. This was well worth the $60 and extra desk space. Good to hear that the revision is tankier, definitely one of the main things I found lacking in the old version, sounds like a winner! What kind of switches are you going to put in your numpad? I’m thinking of going with Gateron Silent Browns. Tactile but not clicky, so I can feel the press from farther away, but silent if I take it to the office. Been dying to try the Silent Reds or Browns. I have Box Browns in my Gen 1 TKL, but don’t love the actuation versus feedback timing on them. Have you tried the Silent Gats yet? No I haven’t had the chance to try the silent gaterons yet, will be looking to do more in-depth switch reviews in the future once I get past all the mainstream boards and mice that I need to take a look at.